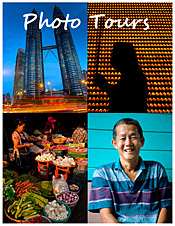 When not on assignment I offer one-on-one, customized photography walks and tours in Penang (and depending on scheduling Kuala Lumpur, Chiang Mai and Istanbul). Tailored to your skill level and goals as a photographer, each walk is preceded by a consultation by email or phone -- whatever works for you -- and ends with a critique of the day's shoot. Past walks/tours have focused on how to take advantage of the features of your camera, how to use natural light, how to become comfortable photographing people and take better portraits, and street photography. Walks start at U$250 for three hours. I require a U$30 non-refundable deposit when you book (the deposit can be applied to future walks if cancellation is 5 days prior to the agreed date). When you make your payment, please be sure to elect the option that lets you, not me, cover currency conversion and transfer fees. Make your payment via Paypal: dhagerman@davidhagermanphotography.com . I''ve been photographing professionally for seven years but making pictures for over 35. I specialize in travel, food, street photography, and portraiture. I have shot assignments all over the world including Asia, Turkey and Mexico. My editorial clients include the New York Times, Saveur, Feast, Wall Street Journal Asia, Budget Travel, Travel+Leisure Southeast Asia, Afar, and South China Morning Post. I've also shot for Electrolux, CIMB Bank, and Nestle's among other companies. My walks have been written up in Destinasian, Canon's PhotoYou and Travel + Leisure SEA. View my photographs at davidhagermanphotography.com , davidhagerman.typepad.com , and on Photoshelter, here. I also publish, with my writer wife, a food blog called EatingAsia. Want to take better food photos? Check out my tips in this article in Zester Daily. Do you like markets? I give tips for shooting better market photos and telling visual stories here. All tours are customizable, so tell me what you're interested in and we'll work on those skills together. As seen in Canon's PhotoYou .